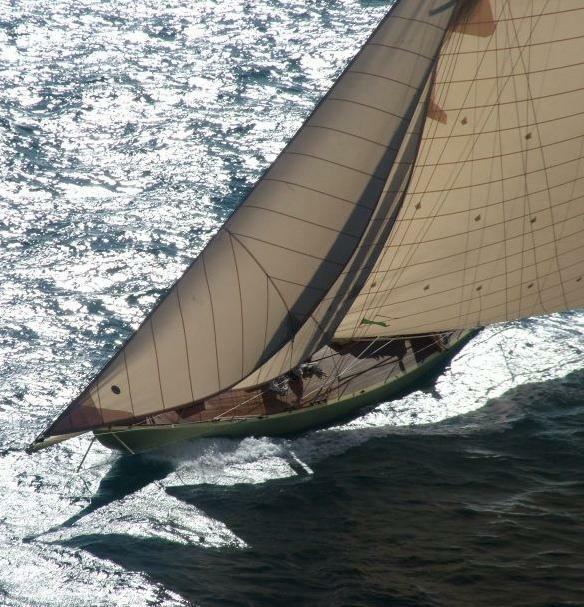 How would you fancy six days of sailing on a 1908, America's Cup first rule 12 metre? Doug Gillanders did! It was a few years ago when I first saw Kate. She was upside down and the hull planking was being applied. I then saw her upright and her deck was being installed. 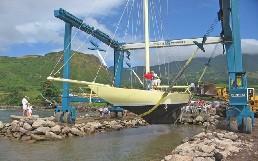 Then, in December 2006, I watched her being launched under the shadow of Brimstone Hill, a UNESCO World Heritage Site on St.Kitts West Indies, for she is not truly a 1908 12 metre, but a faithful replica. On her arrival at Port Zante, I was privileged to go aboard. 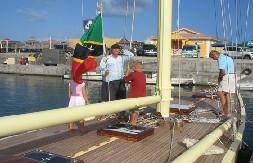 My son Christopher helped owner/builder Philip Walwyn raise the first flag. When I learnt that there might be space on board for the St.Maarten - St.Martin 2007 Classic Yacht Regatta, I put in my application and found that, as there were no other applicants with better qualifications, I was accepted. 06:00. Crew mustered on the beach, with sleeping bags, some clothes and, in my case, three 1-litre bottles of Mount Gay Extra Old rum. There was Anthony – of middle eastern extraction; Bruce – a Jamaican; and myself – an Anguillian (one of my many nationalities). We set out in an inflatable of questionable age (to deter the more larceny minded) powered by a 9hp Mercury outboard. The rest of the crew consisted of owner/captain Philip Walwyn – a Kittitian; Johnny – a Kittitian, who had helped Philip build Kate and James – out from the UK, who had all spent the night aboard. 07:00 All hands to action. No pleasure cruise this, No electric winches, no electric windlass, Philip is a real out and out purist and it was raw manpower all the way. First up was the jib. Quite easy in the light morning breeze – more about that later. Then up with the main. Two men on the throat and one on the peak. A bit of sweating up (including mine) and it was done. 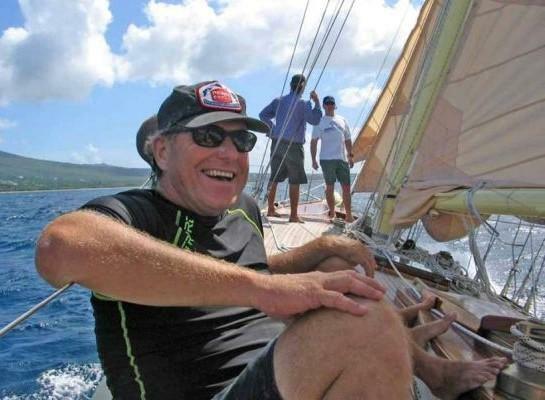 Skipper was considerate enough to bear into the wind to ease the pressure on the sail to allow a bit more sweating. The staysail was next which was relatively easy to haul up. After the ends of the halyards were tidied up we settled down on the first reach to Nag’s Head in the South East. St Maarten was to the north but, given the wind direction, it was determined that the best course was around Nag’s Head, in the south eastern peninsula and up the Narrows and along the windward side of St. Kitts, rather than the leeward side, and then through the Statia channel. I then did a stint on the helm. Using a tiller – no wimpy wheel here. The wind increased and we were running with the rail under and occasionally the top wire of the safety lines. This also resulted in quite a bit of weather helm. It’s amazing how ‘frozen’ your muscles can become when kept continually tensed with quite a load on them. 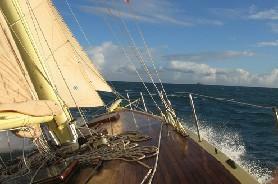 The sail was just plain enjoyable; sunshine, some fluffy white clouds and a moderate to calm sea. On arrival, we anchored with a great big CQR and a decent sized Fortress the former being bloody heavy and the later being quite maneuverable. The Peg Leg Bar ended our day with a great meal and my drinking an enjoyable Belgian beer with a name somewhat like “Lette Blond”. Cracking of dawn was only just about to begin and we were all up and wide awake. Kate was being ‘presented’ that evening at the St. Maarten Yacht Club so the first order was to make sure that Kate was clean and tidy; I should say shipshape and Bristol fashion below. The decks were to receive another ‘oiling’. There were a few items to be picked up at Island Waterworld, the local chandlery and, as I needed a boarding ladder for my own boat, I offered to go in with the dinghy. By the time we got back, after a nice leisurely breakfast on a dockside café, the deck had been almost all oiled. The rest of the chores were finished, without further delay, and it was time for a beer or two. The St. Maarten Yacht Club is located just inside the lagoon at the Simpson Bay entrance. This entrance is 50’00” wide and has a lifting road bridge. The bridge opens twice a day and we were anchored just outside the entrance. Since Kate is a virtually exact replica, she does not have an engine. This, normally, requires above average seamanship, and sailing through the entrance is not permitted, so the dinghy “Panic Major” was pressed into bow/stern thruster duty and ‘96 Degrees’ a 25-foot Mako, powered by a 225 hp Yamaha, was lashed amidships, to serve as main propulsion. This was crewed by Pascal and Tuesday, who were very, very helpful throughout our stay. At 5:30pm, Kate joined the end of the queue of megayachts, not quite so megayachts and just yachts and proceeded into the lagoon. Loud prolonged cheers from a huge crowd at the Yacht Club greeted Kate. We were taken a bit by surprise, as the presentation was not meant to be until 9:00pm. 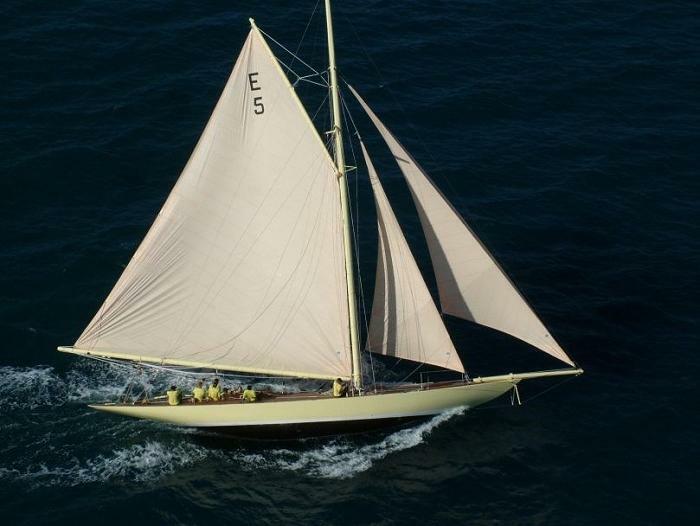 The ‘toe killer’ is a lead for the staysail and is positioned in the precise location to result in a mutilated toe; I wore shoes on deck, except in this picture. The rope coiled around the offending item was placed to minimise the hospital expenses for visitors that evening. This morning the bridge opened especially for Kate at 7:30am. 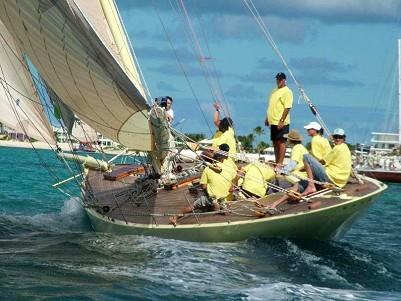 The first race was from Simpson Bay to Marigot Bay, but we knew this regatta was really a learning curve. Kate had only been in the water for about five weeks and the crew hadn’t had a chance to sail that much together. In fact, at this point we had only sailed about 80 miles as a team. The start was just about perfect and Kate got into her stride and creamed away on a reach for Blowing Rock. The wind was supposed to stay in the north. Murphy’s law came into play and it shifted to the north-east. As Kate rounded Blowing Rock, she then faced an uphill stride and I understand that beating to windward is not a gaff rigged vessel’s best point of sail. Our concentration was also, initially, disturbed by the camera persons, in a helicopter, and numerous power boats on all three days. In the end we came third on corrected time. That night the swells picked up and rolled in from the North. Kate was subjected to their full force, so sleep was fitful. Another pre-dawn start aboard, saw morning aerobics comprised of hauling up the CQR and Fortress. 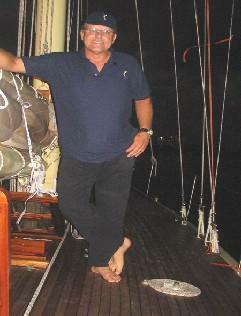 We transferred the anchor rode to the stern, so we were able to sail away under control through the maze of yachts. Start was good but not as good as the first day. A reach to Blowing Rock, then another to the leeward marker buoy, followed by a beat up to Philipsburg. Again the wind did not favour us and we finished in second place. BBQ lunch was followed by a decision to move the top of the mast forward at 4:00pm. This entailed removing a chock – easier said than done - in the keelson, erecting a number of pulleys and a lot of winching.Led by Philip, everything went smoothly. Then the Norse fittings, at the end of the stainless steel rigging to the bow sprit, needed to be shortened. Fortunately we were able to use a vice ashore. Two fittings were removed, the cabling shortened and fittings refitted. Work was halted at dusk, which comes down very quickly in the Caribbean. Then the beers set in. We had heard that the start was 10:00 am, but that was dashed when it was advised that it would be 9:00am as usual. The cable to the last Norse fitting still needed to be shortened, so again, this time at 6:30am on a Sunday, we set out to use a vice ashore. No time for breakfast. was not too great, but was enough to leave a dark 4” diameter black and blue area on my upper thigh. The adjustment to the mast appeared to help, but it was not enough. There was a short downwind stretch, then a reach back to Simpson Bay. Kate gained ground on the reach, but despite constant attention to sail trimming we were beaten into third place by about a minute. Another early start. Another hauling of the anchors. Another sweating up of the main, staysail and jib. The sea was fairly calm. We took in a reef and set off homeward bound. As we passed along the coast, often less than 200 yards off shore, I was reminded of how beautiful the island of St.Kitts really is and how much I take it for granted. 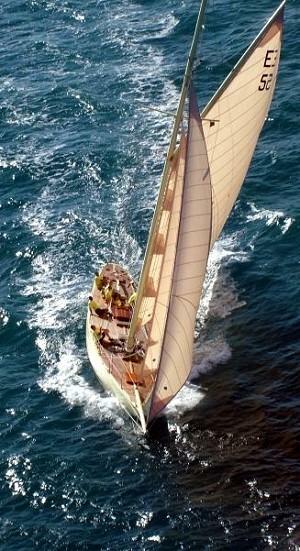 If you ever have the opportunity to sail on a first rule twelve metre yacht, especially Kate, grab it with both hands. I cannot recommend it highly enough. The rum? The crew and guests finished that after the Saturday race. The Regatta? I experienced a great adventure, of which I have nothing but wonderful memories, and I guess that goes for my fellow crew members.